UPDATED for Battle for Azeroth!!! SMQueue is a small LDB-plugin that was created to keep track of queue times when queueing. It is intended to replace eQueue and be a viable alternative to iQueue. It is a work-in-progress, and is based somewhat on iQueue and eQueue, but includes some additional features. 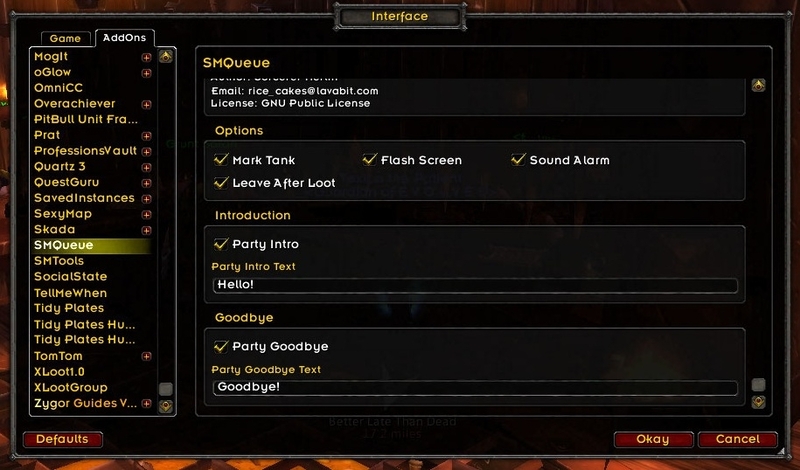 As stated above, SMQueue is a LDB-plugin, which means you will need to have an LDB display AddOn of some sort in order to make use of it. **Otherwise it will not function. ** My favorite LDB display AddOn is Bazooka, although there are others out there! Hooks the mouse-over tooltip and displays it on the LDB button instead of the Minimap button (which is hidden). Also allows display of custom tootlip. Has options to mark the tank, send chat messages on dungeon arrival/leaving, leave party after loot is distributed (with confirmation). Has option to sound an alarm at max volume (no matter what current volume is set to) when LFD/LFR proposal is displayed, and flash the screen. Will display time waited of time estimated for selected queue (cycle thru them by left-clicking the LDB buton at any time). 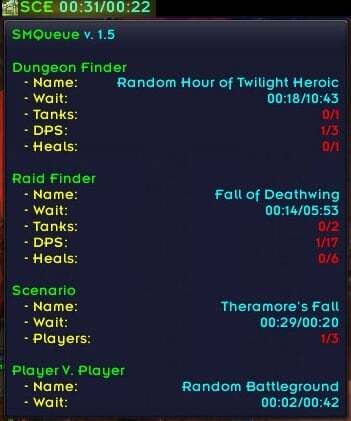 Due to the way MoP/5.0.4 changed queues to be able to queue for all things at once, this is the way I have chosen to still show time text. If anyone has a better suggestion or idea, please let me know! Also allows auto-selecting of queue when only in ONE queue, and only displaying queues that are being used. PVP support is now available, although I am not necessarily qualified to test it, as I don't PvP too often. As far as I am aware, tracking World PvP basically disappeared with MoP/5.0.4 but if anyone can better explain this or has a resolution please let me know! Please use the ticketing system for major bugs or issues. If you would like to make a suggestion for a feature, or something similar, post a comment on the page. Thanks! 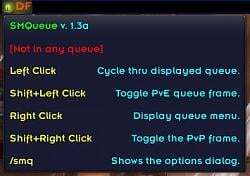 You can reach SMQueue's in-game options by going the usual route through Interface Options or using the slash command: /SMQ. Re-integrated Ace3 to latest available version. Fixed issue with Intro Chat not being sent to party due a timing/event trigger error. Re-enabled toggle for built-in Blizzard tooltips to be shown on LDB icon. 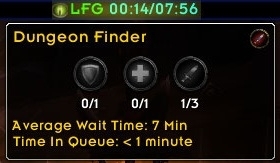 Re-enabled ability to chose default queue to be displayed as LDB text. Tested with multiple situations to determine stability and ease of use. Just updated it again, seems I forgot to have the DEBUG mode be disabled by default. Also, some of the Options dialog code was acting weird so did some fixing. Check it out! Thanks. Just started doing a bit of PVP and noticed an error. It seems an event has been removed so the PVP window no longer opens. It will work properly again. Thanks again for a great addon. Everything is still working fantastically for me. Just have a question regarding savedvariables this time around. Does the savedvariables file only hold settings that have changed from default? For example, in the config.lua file, "MarkTank = true," is the Default. I go in game and uncheck that option in the settings. If I then look at the savedvariables file I see the line "["MarkTank"] = false,". No other lines besides toon name, server, and profile name are listed. So the other settings that are possible do not get listed until they are changed from the Default as it's seen in the config.lua file? Sorry, I have been out of loop forever. PCSing with the military is a giant pain, and I have been stuck with my laptop that is incapable of doing much of anything (especially WoW!). Anyway, in the next few weeks I will be getting back to being a regular addon author again. As far as your long over due answer here, I will have to get back to you because I honestly don't remember LOL. I know that I was using AceConfig/AceDB libraries, so your observations could be true. I'll look into it and let you know. Talk again soon. Last edited by sorcerermerlin : 11-27-12 at 07:30 PM. Yea this is what I see now with the latest SMQueue as you reported when I finally have some solid play time in. The right click option is anchored to the lower left corner. That is why it totally baffles me. The mouseover tooltip works fine. Everything displays properly on screen and above the bar as it should. It is only when I attempt to access the queue with the right click that becomes unavailable. The tooltip portion shows above and I guess the enter dungeon portion shows below the tooltip which ends up below the screen. I just installed a new copy of DockingStation, SMQueue, Ace3 and also Broker_Micromenu for testing. I left all settings on default except for enabling SMQueue, moving the bar to the very bottom and also locking the bar. The mouseover tooltip is working perfectly fine just like you experienced. I joined a queue and everything worked fine there. I decided to leave the queue so I right clicked on the LDB text for SMQueue. The right click menu actually appeared above the bar as it should, but, it appeared to the far left as if it was anchored to the bottom left of the screen. The tooltip is there with a default install, just not directly over the LDB plugin for some reason. Last edited by Vis : 09-28-12 at 02:55 PM. @Vis: Answering posts from phone until done moving. Probably tomorrow I will look at the code again. I can't find any Blizzard API that gives you an estimated wait time for Pet Battles. So I may just do a time diff to show how long you've been waiting... and no role display needed either lol so I'm not sure yet. When I get done moving I will look more into it. Stay tuned. I haven't really had a chance to test out the new layout yet. From what I see, it all looks great. Still not encountering any issues. Out of curiosity, what were you thinking of adding for Pet Battles? I just checked using Bazooka at least and the tooltip does properly change to be above the bar when Bazooka's bars are on the bottom of the screen. It may be a setting within DockingStation that is causing an issue or could also be a difference in how the displays show information. I haven't tested the newest version yet so I may be a few versions behind but I was glad to see a replacement for eQueue so I tried this a few days back (this was I think Monday, before MoP's release). When I tried it, I ran into an issue that I couldn't seem to find a way around. As I noticed in your screenshots, your LDB display bar is on the top of your screen but for my UI I decided I was more comfortable having it on the bottom (I use DockingStation if that matters) of my screen. With it on the bottom, whenever I try to right click to bring up the queue options like trying to use it to teleport to the dungeon when the queue pops but i'm dead and had to rez so needed a teleport after rezzing, I couldn't bring up the menu because for some reason it pops the menu below my visible screen. None of the other LDB plugins I have running with DockingStation in the years i've run with it has even run into this problem so i'm stumped as to how to try and fix it. Alright everyone (Vis?!). I have updated the addon again. Still no Pet Battle support, when I have worked that out I will post another version. This one should be pretty stable, check out the Time Wait Mode option (turning it off will give you the role status as LDB text instead of default behavior). Removed the two options that were added last time, and made their behavior part of the addon and not available as an option. Optimized a few pieces of previous code that needed it. Test and report! Thanks. It appears that Auto Select Queue and Show Only Active options will both do the same thing on my end. It may be best to combine the two options into a single one. A small recommendation on the options page as well would be to change the text for the Builtin Tooltips option. On first glance, seeing it checked by default I got the impression that I would see the Addons Builtin tooltips, not Blizzards. So the text confused me a bit until I toggled it a couple times. Changing the text to read "Show Blizzard Tooltip" may be a clearer way to let the user know what it does. As usual though, I like the changes. They are little features that add big "feel" to your addon. Vis? Now how did I know you would be the first one to test everything? Anyway, after much consideration and a small amount of frustration, I am testing with the option of the auto-select queues and show active queues removed, and having this functionality built-in. It seems that checking for the options isn't working quite the way I wanted, and the functionality seems to make more sense. Anyway. I also changed the name of the tooltip option to reflect what you suggested, as it was a good suggestion. I appreciate your support for my addon and good, yet constructive as well, feedback. Thank you. I haven't posted it yet, want to test it a short bit longer. I would much rather see which roles are missing than how long I've waited in the LDB feed. sort of like this: "T/H/DX" where X is the number of missing DPS. if for example the Tank and one DPS is missing it would be T/D1. 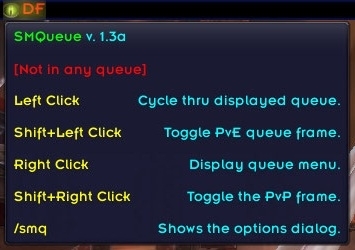 @tordenflesk, this feature is something that iQueue used to do (pre patch 5.0). I personally didn't like it because I wanted to know how long I've been waiting, rather than just knowing which role I'm missing. Never the less, it seems to be a popular request, so I will look at a way to add it as an option instead of the time waited mode. Stay tuned! I've had a chance to play with your addon again and it's looking great. I like how the new custom tooltip looks. Nice and simple and easy on the eyes. And again, no errors for me yet. From my testing, if you have the Auto Select Queue checked, but Show Only Active unchecked, you are still limited to only being able to see the active queues. That's with multiple active queues and with only a single active queue. I can still cycle through the active ones if I'm in more than one queue as intended though. 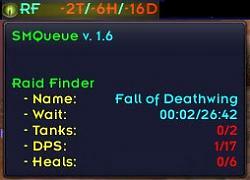 Otherwise, it does work as intended by auto changing to show the first active queue timer. 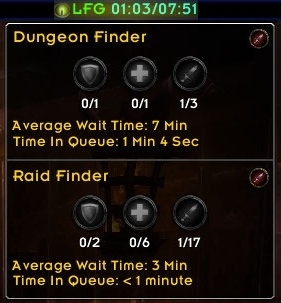 I've seen something similar in one of the other queue addons that showed it like this "THDDD". The letters would change color depending on who was missing. Red letters would represent missing roles, green would indicate a filled role. 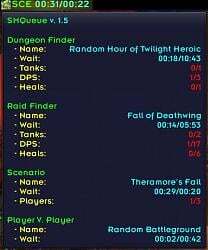 So at a glance if you saw Green DDD and TH was red, you'd know that you had all 3 dps'ers but were still missing a tank and a healer. Something along those lines would be clean and easy to read as well without taking up too much space. *I apologize for yet another wall o text, lol. Last edited by Vis : 09-23-12 at 08:47 AM.